Please remember these Santa Anna folks that are serving our country in combat, training, or support: Brandon Beloat, James Culpepper, Eddie Dawson, Chaplin Delarosa, Kristle Deleon, Glen Donham, Reuben Frausto, Misti Graves, Bobby Hale, Patrick Kerr, Heather LaChance, Truman Matthews, Jeff Rivera, Josh Rivera, Michael Ruth, Marty Siller, Allen Tucker, Lance Vasquez, Scott Watson, Shane Watson, and Seth Wickson. 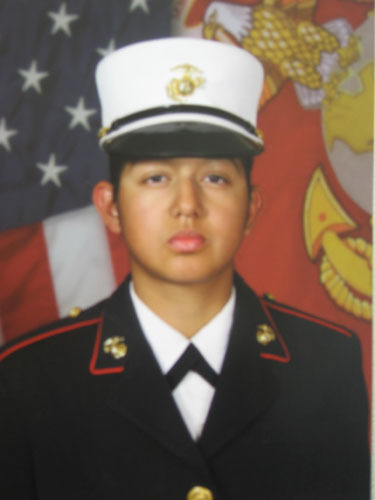 Private First Class Kristle DeLeon a 2007 graduate of Santa Anna High School graduated from 13 weeks of Marine Corps recruit training on March 6, 2009, claiming the title "United States Marine!". 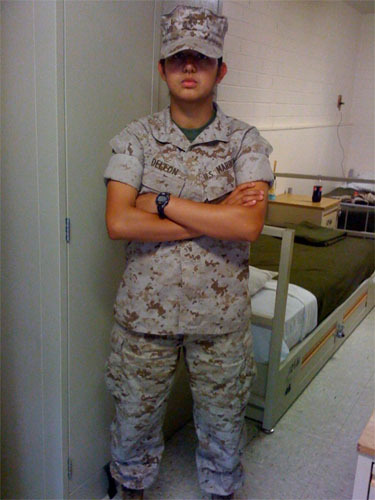 After ten days of leave with her family, she attended the Marine Combat Training for one month at Camp Geiger, NC. Following that she attended Military Postal School for 6 weeks in Fort Jackson, SC. Following postal school, PFC DeLeon came home for five days of leave before she went to her first duty assignment at Camp Pendleton, California. She expects to deploy to Afghanistan within the next six months, tentatively for one year. Saturday, August 29th, Volunteers showed up at the Santa Anna Depot warehouse to begin work on the town's future Museum and Visitor Center. Those who labored were Wanda Campbell, Harold Fahrlender, Donald Strickland, Montie Guthrie III, John Hensley and young Lewis Watts. Wanda Campbell, Donald Strickland, Harold Fahrlender (Driving Machinery) and Lewis Watts. Sylvia Herring will be hosting a three day program for around 30 Texas porcelain art club painters and teachers beginning Wednesday, September 9th at the Santa Anna Armory. 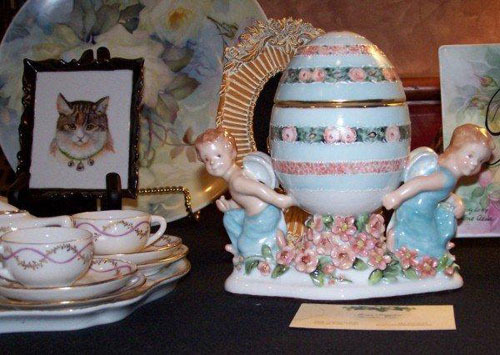 Herring is a member of the State Federation Porcelain Art Clubs of Texas, and has been a porcelain artist for over 37 years. The club’s intention is "to stimulate interest, appreciation and skill in the decoration of fine porcelain." They also tout the motto, "Coming together is a beginning; keeping together is progress; working together is success." 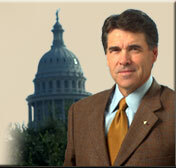 The PAC of Texas was formed in 1958 and currently has 1,087 Club members. Porcelain art, or China was first conceived during the Tang dynasty around 618. Eventually the art spread through Korea, Japan and finally into European nations. For centuries this art has withstood destruction of civilizations, catastrophic earth shaking events and the rise and fall of societies, and has remained venerated and cherished world wide. According to Herring, this years line up will feature Hallmark Cards artist, Julia Cranier along with activities that will include a porcelain art viewing, dinner and music, a Parade of Homes and of course, porcelain painting. The event will kick off with guests arriving at the Sikes Hunting Lodge and Ranger Park Inn, and afterward dinner at the Armory with music being performed by The Denton Family. On Thursday’s agenda is porcelain painting and a road trip to Brownwood for a visit to the home of Alma Graves, who has been involved in porcelain arts for over 56 years. The day will wind up at Underwood’s for dinner, and will be the final day for the guests to fellowship and paint. For more information, you may contact Sylvia Herring at 325-348-3651. The Class of 1984 will be holding it's 25 year reunion on Saturday, October 10, 2009, from 2-5pm at the Housing Authority meeting room. The meeting room is located at the high rise apartments, across from Santa Anna National Bank. The reunion is open to any other's wishing to attend. We had a small class, so would like to see other's that we went to school with as well. 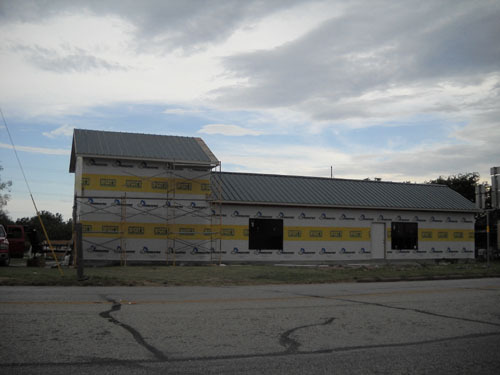 Should you have any questions, please contact Connie Culpepper Massey, at 325-201-2036. Santa Anna Retail Merchants Association (SARMA) sponsored Sizzling Sidewalk Sales over the past weekend. Lots of activities and sales - remember, this was tax free weekend - and other events took place. One of the more special events was the 1st Annual Santa Anna Talent Show. Although not limited to Santa Anna, the contestants were limited in number. Some very talented ladies provided a good show while the audience enjoyed Paula Blanton's prize winning ice cream and the talents of the contestants. The next major event coming to Downtown Santa Anna is the Two Nights of Christmas in a Small Town. This is an annual event that has in the past included wine tasting, artists and their works, authors and their books, and even famous people roaming the streets and shops along with Santa Claus. During the Two Nights of Christmas, a drawing will be held for a Gift Basket estimated to be worth over $500 at this time. It is possible that before the event the value will be raised with more donations. We look for you in Beautiful Downtown Santa Anna on those dates, but you are welcome to visit and shop with the friendly merchants and dine in the best restaurants anywhere at any time that you choose. Directors Elected at Annual Meeting of Coleman County Telephone Cooperative, Inc. The 56th annual meeting of Coleman County Telephone Cooperative, Inc. was held on Friday, August 21, 2009 at the Santa Anna Civic Center. The event was attended by approximately 400 people, 246 of those being registered members and eligible to vote in the election. The two directors elected for 3-year terms were incumbents John Hensley, representing the Santa Anna Rural (South) area and Thomas Rutherford, representing the Rockwood area. Stanley Hartman, President of the Cooperative’s board of Directors, called the meeting to order and led the crowd in the pledge of allegiance. The invocation was delivered by Director, Roddy Dean. Mr. Hartman then presented the welcome address and expressed his appreciation to those in attendance. Director Roddy Dean, representing the Cooperative’s scholarship committee, presented certificates to this year’s recipients of the Tom Kingsbery memorial scholarship. Three college students each received a $1,000 scholarship to be sent to their respective schools. The recipients included Adria (Addie) Vasquez, daughter of Benjamin and Melinda Vasquez, Samuel Matthew Vasquez, son of Jr. and Mary Vasquez, and K’Lynn Lefevre, daughter of Cliff and Renee’ Lefevre. Other items on the agenda included a financial report by accountant, Janice Fellers and a report by general manager, Tim Humpert. Among the special guests in attendance were Herman Roark of TRC Engineering Services and Ellis McCasland of GVNW Consulting. 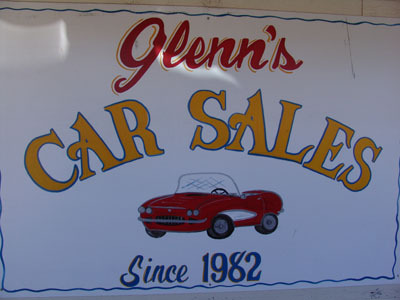 Both of these companies, along with John Staurulakis, Inc. donated cash prizes for the drawing. The meeting concluded with a drawing for prizes for children and adults. 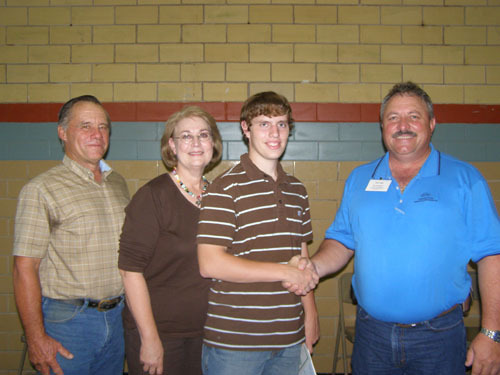 Coleman County Telephone Cooperative announced the recipients of The Tom Kingsbery Memorial Scholarship at its annual meeting held on Friday, August 21, 2009. 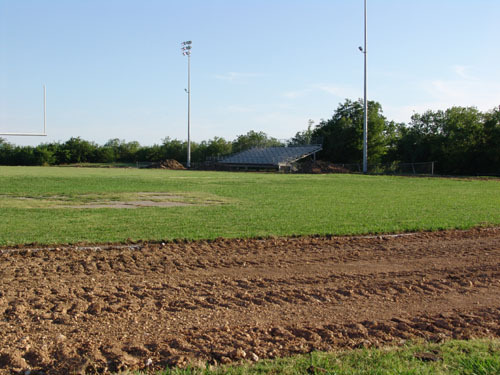 The scholarship fund was established by Coleman County Telephone Cooperative in 1999 in memory of Tom Kingsbery, who served on the Cooperative board of directors for over 35 years. The Cooperative sets aside $3,000 a year for this Scholarship Fund, which is awarded in the form of three (3) $1,000-dollar scholarships to 3 college students in the Cooperative's service area. Aria (Addie) Vasquez - Addie is a 2008 graduate of Coleman High School who is attending Tarleton State University, studying to become veterinarian. She is the daughter of Benjamin and Melinda Vasquez. Samuel Matthew Vasquez - Matthew is a 2005 graduate of Santa Anna High School who is attending Howard Payne University, studying to become a teacher & coach. He is the son of Jr. and Mary Vasquez. K’Lynn Lefevre - K’Lynn is a 2006 graduate of Coleman High School who is attending Cisco College, pursuing a degree in nursing. She is the daughter of Cliff and Renee’ LeFevre. Pictured (L-R) is CCTC General Manager Tim Humpert, Matthew Vasquez, Addie Vazquez, K'Lynn Lefevre, and CCTC Board Member Roddy Dean. The Foundation for Rural Service, a division of the National Telecommunications Cooperative Association, has been sponsoring a College Scholarship Program for the last ten years. Each year a team of educators from the Washington, DC area reviews the applications and chooses the recipients. 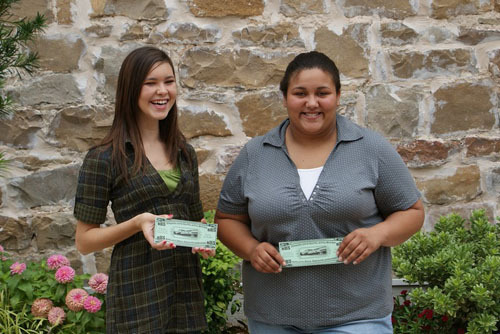 This program annually awards $75,000 in scholarships to rural youth across the United States. Each $2,500-scholarship is made up of $2,000 from FRS and $500 from the local cooperative of each student. This year FRS received over 1,200 applications, and awarded only thirty (30) scholarships across the nation. We are very proud to announce that one of those 30 scholarships was awarded to a student from Coleman County Telephone’s service area. The recipient of this year’s FRS/CCTC $2,500 scholarship is Reece Halfmann. Reece is the valedictorian of the 2009 graduating class of Coleman High School. His future plans include attending Texas A & M University to major in Electrical Engineering. Reece is the son of Lorene and Tommy Halfmann of Talpa. Everyone at CCTC would like to congratulate Reece and wish him the very best of luck as he pursues his education and career goals. Pictured (L-R) Tommy Halfmann, Lorene Halfmann, Reece Halfmann, and CCTC General Mangager Tim Humpert. 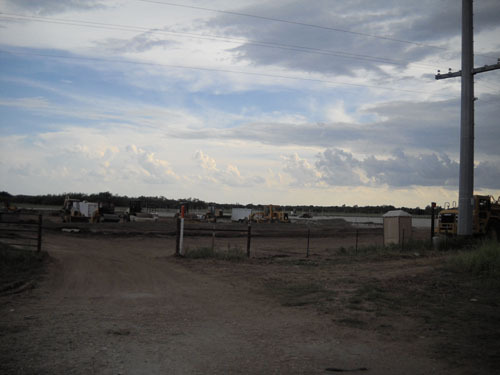 According to AEP officials, AEP West Texas is building a grid switching station East of Santa Anna on US Hwy 67/84 just across the road from the Texas Ranger Motel. Ready or not, it is time for school to start! Be careful in the school zones, neighborhoods with kids, and watch for those school buses. Better start practicing for the new cell phone laws that begin September 1st too. Saturday, August 29th, the Santa Anna Economic Development Board will be holding a workday at the old warehouse train depot downtown. 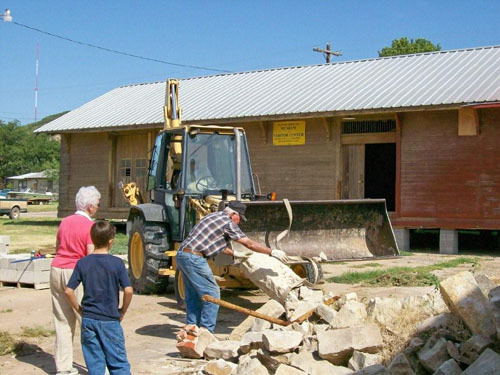 The event is being held in order to prepare the building for the Museum and Visitors Center that will occupy the building. Anyone that is able to contribute at this time is encouraged to attend. Meet the Mountaineers was well attended. It was a good opportunity to meet the new coaches Mr. and Mrs. Jim Eubank. If Jim Eubank sounds familiar to you it should because he is a member of the SAHS Class of 69 and a son of Santa Anna's James Eubank and brother to Jana Taylor and Jo Jones. Coach Eubank is sure to draw a local following of family and friends especially when you throw in the Deans, Taylors, and Joneses. His first year in six-man football may prove a challenge but Coach Eubank is no stranger to football with 30 years experience as coach. Coach Eubank said it was "..good to be home." and Coach we are glad to have you home. I will get some pictures up a little later this week. The Santa Anna Mountaineer Varsity Cheerleaders along with the Mountaineer Booster Club would like to invite everyone to Meet the Mountaineers on Tuesday, August 18th at 8:00pm at Mountaineer Stadium. Booster Club will be serving hot dogs, chips and sodas. We hope to see you there supporting the 2009-2010 Santa Anna Mountaineer Athletes. It's going to be a great year! Santa Anna Mountaineer Varsity Cheerleaders pictured left to right: Paige, Kourtney, Heather, Aspyn, Ashley, Hannah, and Saydie. It’s that time again. The Coleman County Telephone Cooperative will be having its 56th annual meeting on Friday, August 21st at the Santa Anna Civic Center (Armory) beginning at 6 p.m. This is always a time that many in the surrounding area look forward to. There’s always fun door prizes, election of directorship positions, presentation of scholarships, coop business update and of course, the seeing of friends and neighbors. According to CCTC employee Janice Fellers, an average of approximately three to four hundred coop members pack in the Armory for the annual meeting. Up for grabs this year are two director’s seats. In rural south, Phil Cozart will vie against incumbent, Vice President, John Hensley for his position. And for the Rockwood exchange, Jim Pool is up against incumbent, Secretary, Thomas Rutherford. Currently serving on the board are the two previously mentioned directors as well as President, Stanley Hartman, Glenda Gassiot of Valera, Rick Adams, of Burkett, Rodney (Roddy) Dean of rural north and Mike Stephenson of Mozelle. Gay Abernathy of CCTC says that the process for bringing in new directors begins by appointments. A nomination committee of nine appointed by the board of directors has the task of sending out letters of notice to those who may be interested in the position, as well as taking in suggestions or requests. From that point on, it’s up to the members attending the meeting to register and vote for the director of their choice. On August 1, 2008, CCTC welcomed its new manager, Tim Humpert to the community. 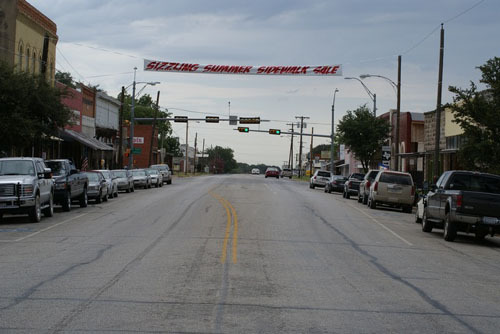 Humpert came to Santa Anna from Windthorst, Texas with an impressive 34 year track record in the phone business, as well as serving on the board of directors for the Texas Telephone Association, the Texas Statewide Cooperative Telephone Association and the Texas Lonestar Network Association. Humpert managed a family owned community telephone company for nineteen years before deciding on the move to Santa Anna. 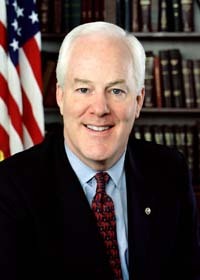 He began his study in electronics working as a civilian at a Naval Space Surveillance Station on Lake Kickapoo, outside of Archer City, Texas. According to Humpert, the station had the capabilities of transmitting signals of objects in space to only five other stations world wide. After being employed by the Navy for a time, Humpert’s knowledge of electronics compelled his father to call on his services in order to work for the family operated phone company. Humpert has been married to wife, Marilyn who works in banking, for 32 years. Both are extremely proud of daughter, Hayley, who recently graduated with a psychology degree from SWU in Georgetown. After moving to Santa Anna, Humpert was able to acquire some acreage outside of town. Humpert said, "I like to farm wheat, oats, hay... coastal in the future." When asked what his other activities are besides his required traveling and farming, Humpert replied, "I enjoy meeting with the "Santa Anna Brain Trusts" on some Saturday mornings at the Coleman County Woodshop. They’re always going to offer their opinion." Coleman County Telephone Cooperative was formed in 1953 in order to provide phone service for Santa Anna, Mozelle, Burkett, Lake Coleman, Rockwood and Valera. In the past 56 years, CCTC has undergone such a metamorphoses to the extent that those who were around during its conception, might not have thought its current technological capabilities possible. In fact in those days, folks were using the dial phone by inserting an index finger into a metallic hole over an numeric and alphabetic indicator. By propelling these numbers or letters in sequence, one was able to determine the destination and party of the recipient of the phone call. Today, CCTC has a total of 16 employees and deservedly boast that "the goal of the employees and directors has remained striving to meet the need for improved and expanded communications, while still providing the quality customer service on which our cooperative was founded." CCTC was able to move service outside the membership area after forming the Coleman County Telecommunications Ltd. In 1989. They’ve added to the Coop family a subsidiary, Web-Access Internet Service. As technological advances take place throughout the world, CCTC and Web-Access has been able to keep up by offering high speed wireless and dial-up Internet, as well as high speed DSL network to the area . Edd and Ruby Hartman celebrated their 68th wedding anniversary with a fish fry at their son's home at Lake Brownwood, Sat, Aug 15th. Their anniversary as well as both their birthdays are in the month of August. Pictured (below) with the celebrants are their children (L to R) Cindy Boyle, Ronnie Hartman, Stanley Hartman, Sandra Walker, and Eddie Hartman. It is not often that I post News items on Friday or Saturday nights but I had this wonderful (you don't here that from me very often, if ever, either).. wonderful story in my e-mail this Friday when I got home from work and felt like it was worth the effort and I think you will too! Let me tell you "About You" or "About Us" as you titled this section of your newspaper. 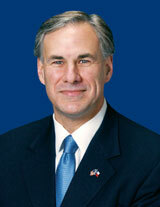 You may begin to wonder how does a person from about 300 miles away know about us in Santa Anna, Texas? I believe that it was in the summer of 1970 that my wife (expecting our first born), my younger sister, my younger brother and I were migrating to the state of Colorado in search of migrant farm work. We were driving in an old 1960 chevy pickup truck. It was a very hot Saturday afternoon I would say about 2 or maybe 3 P.M. My wife was having morning sickness all day long. The water pump on the truck burst about 20 or so miles south of Santa Anna. This was my first trip migrating North without my parents. I was in charge, since I was the oldest at 19. I checked the damages to the vihicle and it was not a pretty site! The blades of the fan were twisted, the radiator was sliced by the fan, the fan belt was ripped, the pully that held the fan belt in place was bent,and the water pump had busted into several pieces. I kept thinking what will we do out here in the middle of no where, not knowing anyone, and with very little money. I decided to hitch a ride to the closest town, Santa Anna, Texas. The first pick-up that stopped was an anglo man pulling a trailer and asked what had happened. I explained to him that my truck broke down. He asked me if I wanted him to pull my vehicle to town. I asked him if he could do it with his truck already pulling a trailer, and he said that he could. So we hitched my truck with a tow chain. He told me that he was going to pull me into a garage that was located just inside the city that beloned to a black man, who was a good mechanic and very resonable. My truck was pulled onto the garage property under a tree. The anglo gentleman was very nice, and I thanked him for his help. There were several men there talking when I approached the mechanic shop and asked for the mechanic. A tall slender black man wearing, I believe, overalls came toward me and said that he was the mechanic. He walked with me to my truck to looked it over. "The first thing we have to do," he said, "is get to the auto parts store because it is Saturday, and if they close they won't open until Momday morning." The mechanic instructed me to buy the water pump and the fan belt at the auto parts store. An hispanic gentleman sitting there volunteered to take me to get the parts. After we brought the water pump and the belt we headed back to the shop. My wife and sister and brother were gone! I asked the black man where had my family gone to! "They are across the street with the wife of the man who took you to get the parts", replied the black man. The lady had seen that our truck was being repaired, and that my wife was pregnant. So she had invited them over to get out of the hot sun and to have some kool-aid with some tacos. My wife stepped out of the front door of a house right across the street to wave at me and reasure me that they were alright. The mechanic had already taken out the radiator, and he told me that it could be repaired. Now, I needed to go to some local used auto part junk yards to look for a fan and a pully. Again the hispanic man volunteered to take me hunting for the needed used parts. We had no problems finding the fan but the pully was a different story. It was about 5 or maybe 6 P.M. and at the last junk yard of the area and still looking for the very elusive pulley. Just like the fan the pulley had to be the right one because a little off balance the water pump could burst again. It was closing time for this last junk yard, and we were the last ones there. We started to walk out without the much needed pulley. I was tired and not a very happy camper when I looked down toward the ground as I was walking out and saw a pulley halfway buried in the ground. I dug it out and to my surprise it was exacly the pulley we needed. The men working in the yard just wanted to go home for the weekend, and told me to just go ahead and take it. We rushed back to the shop and the mechanic was just waiting for the last two parts to finish the job. Within the next hour or so the truck was finished. I asked the man who had taken me, all over the surrounding area, to get the parts how much I owed him and he said, "Nothing!" I stuck out my hand as I had done once earlier before that day and shook the man's hand and said, "Thank you from the bottom of my heart." Then I directed myself to the black mechanic and asked how much I owed him. It should not have surprised me to hear the third man that had helped us that day, say a third time, "Nothing!" This man had worked all afternoon on my truck almost until there was no light from the sun up above, and he would not charge me any money for his hard work. I knew that we barely had enough money to get us to our destination, and I could only afford very little to pay, but I never expected to pay nothing! I took a five dollar bill and tried to give it to him, but he would not take it. I shook his hand and stuck the five bill in his shirt pocket and said thank you. My wife and sister and brother came back from across the street with some taquitos and some kool-aid the lady had prepared for me. I was tired and starved and appreciated the most delicious tacos I had ever tasted and off we went to Colorado! So you see I do know "About You" or "About Us" in Santa Anna, Texas. I know that there are angels in Santa Anna, Texas, and they come in different colors! My Dad passed away a year ago today, August 14th. There has been a lot of things going on around town and I have wanted to cover them but we have been working longer hours lately and just can't seem to get the time or energy. Let me see if I can catch up a little... over the next few days before school starts. Some businesses open up pretty quick and some take a little longer. I came up with the idea that I was going to tell you about this one before they got it built but I was beginning to wonder. But I couldn't remember the exact name and I couldn't read the name on the sign in the picture. I sort of came up with a goal to tell you about it before they got the roof on and it looks like I made it. As of August the 13th they still lacked a little on the roof and got home early enough and with enough time to take some more pictures! 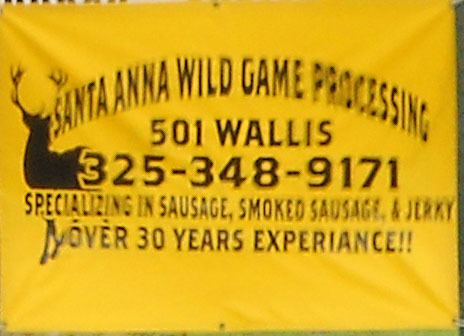 The name of the new business is Santa Anna Wild Game Processing, 501 Wallis Avenue. Well at least we are getting rid of the old one! According to my SantaAnnaNews.com camera a couple of weeks ago, actually July 19th, and the bulldozer along with the piles of asphalt the old track is at least gone. 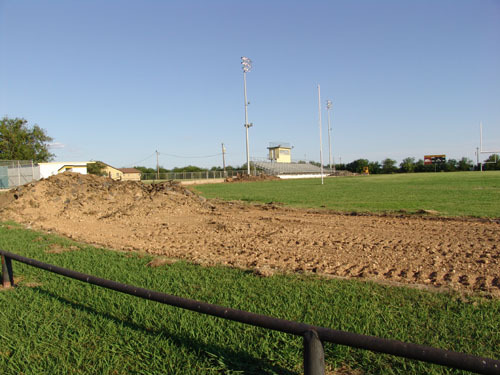 According to school officials, we will be getting a new track but there is no contract yet as of a couple of weeks ago. I am ready to go back to school... are you? It looks like we are having hot rolls on the 26th... am not sure who used to cook them but I sure miss Mrs. Wardlow's, Mrs. Langford's, Mrs. Tucker's, Mrs. Guerrero's, Mrs. Cupps's, Mrs. Siller's, Mrs. Fellers's, and Mrs. Upchurch's hot rolls! Happy Birthday to SantaAnnaNews.com and Cindy, my girlfriend for life! It just happens to share a birthday with my wife Cindy. I won't tell you how old she is but a man from Texas was President when she was born. 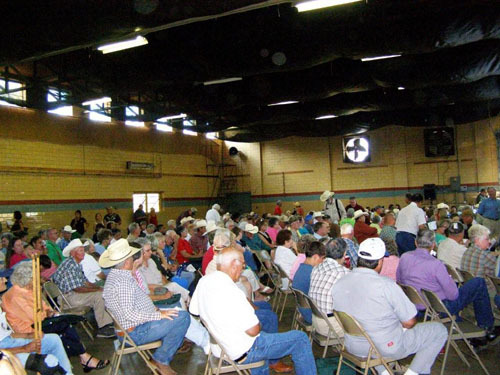 The 56th Annual Meeting of the members of Coleman County Telephone Cooperative, Inc. will be held on Friday, August 21, 2009 at the Santa Anna Civic Center (armory), located at 303 S. Houston in Santa Anna. Registration and voting will begin at 6:00 P.M., followed by the business meeting at 7:00 P.M.
All attending members will receive door prizes as they register, and will also be eligible for other prizes to be awarded during the drawing to be held at the conclusion of the business meeting. Children will also be eligible for special prizes. The agenda for the meeting includes a report of officers and the annual financial report, along with the presentation of three $1,000 Tom Kingsbery Memorial Scholarships, the election of two directors of the Cooperative, and the General Manager’s report. The two Board members to be elected will represent Santa Anna Rural (South) and Rockwood. Candidates for the Santa Anna Rural (South) position are incumbent, John Hensley, and Phil Cozart. The nominees for the Rockwood area are incumbent, Thomas Rutherford, and Jim Pool. The Cooperative would like to remind all members that they are not restricted to voting only during the years when directors representing their exchange are up for election, but should vote each year for the candidates of their choice in each exchange represented on the ballot. Those currently serving on the Board are President - Stanley Hartman, Vice-President - John Hensley, Secretary - Thomas Rutherford, and other members Glenda Gassiot, Rick Adams, Roddy Dean, and Mike Stephenson. The General Manager, Tim Humpert, and the Board of Directors encourage all members to attend the upcoming Annual Meeting of Coleman County Telephone Cooperative, Inc.
On August 10th, lifetime Santa Anna resident Montie Lester Guthrie Jr. Turned 90 years old. Saturday around 50 family and friends turned up at the Santa Anna Armory for a celebration of grandpa’s life, as he is often addressed. Most folks in Santa Anna know that if there is anything factual that they would want to know about the history of the community, then they can always rely on M. L., as he is also known, for a rundown of people, places and events. And, if you happen to be at the Double H Restaurant at either 10 a.m or 3 in the afternoon, you might be able to catch some of the colorful stories of the past that M. L. Is imparting to friends during his daily snack and coffee breaks. According to compadre Rob Cheaney, you can find "grandpa" there most everyday except Sundays when he is attending the Presbyterian Church. "He’s as regular as Dr. Pepper" said Cheaney. Friend Tom Bell (who M.L. 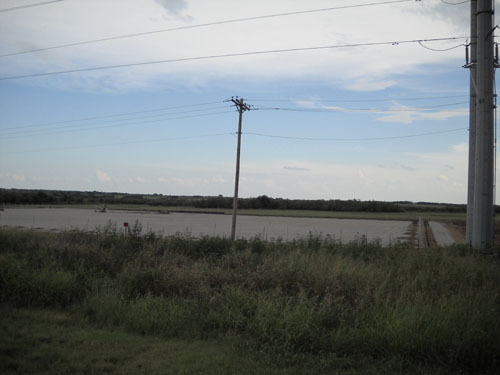 Refers to as "radio") said of Guthrie, "Every community has those characters, not figures, but characters who embody the best traits of all that community’s generations, past and present. M. L. Guthrie Jr. Comes from what is called the greatest generation, those who formed their character in the 'great depression' and Word War II. Montie Guthrie Jr. Is just such a character from that greatest generation." In 1919, Montie Jr. Was blessed to parents Montie Lester Guthrie (Rat) and Hattie Tom Miles Guthrie. 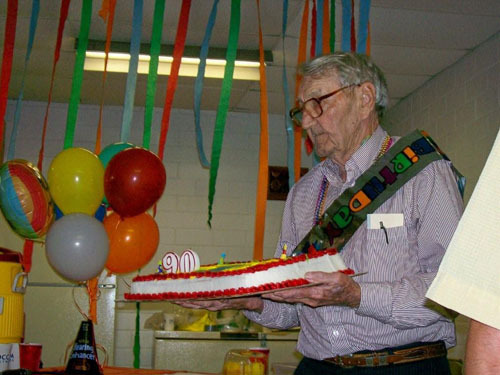 After graduating from Santa Anna High School in 1938, Montie Jr., went to work at Homer Hudgins’ Mobile gas station and later went on to college in San Marcos, but had to quit after his first year because his father became ill. In 1940, M. L. Worked for Banner Ice House with future brother in-law, Thomas Wristen, as well as working to build Camp Bowie in Brownwood. Montie Jr. Joined the United States Army Air Corps in 1941 with friend Floyd Gilbreath in time to serve his country during the outbreak of World War II. After initially being stationed at Brooks Air Force Base in San Antonio for basic training, and later Nellis Air Force Base in Las Vegas, Nevada, Scott Air Force Base in Illinois, Mirana Army Air field in Arizona and "Last Stop USA" Camp Shanks in New York, M. L. Found himself on the Queen Elizabeth bound for Scotland where he served as an MP on the ship’s forward bow. According to M. L., the ship had to change course every three minutes in order to avoid German submarine torpedoes. In 1945, Staff Sergeant Guthrie was quartered at the Hardwick Air Base in England (along with actor, James Stewart) and served as radio tower personnel before returning to the U.S., once again boarding the Queen Mary from Scotland. Less than a year later, Montie Jr. Married the love of his life, Billie Raye Barnett, and later produced two sons, Montie Lester Guthrie III and Gordon Lane Guthrie, also both lifelong residents of Santa Anna. Guthrie continued to serve, but this time in the capacity of a civilian. In 1950 he began working for the United States Post Office until retiring in 1978. After retirement, M. L. And wife Billie farmed and ranched their land which edged Santa Anna proper, and later in the mid 90’s opened the Treasure Hut Antique Store. Montie Jr. Is also a lover of music, with his favorite musician being the late Glen Miller. And by son Montie Guthrie III‘s account, his father and mother were both partial to the song "Stardust" by Hoagy Carmichael. In June, 2006, Montie Guthrie Jr. And wife Billie celebrated their 60th wedding anniversary before illness claimed the life of his bride almost a year later. Guthrie says that his greatest thrill has been taking care of his six grandkids and being able to take them places. He has also enjoyed farming, ranching and working his store. "I am a lucky man. 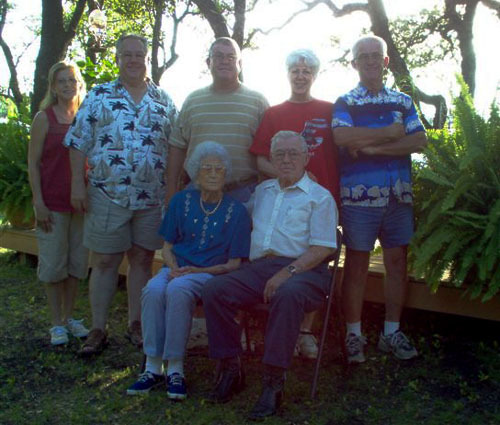 I’ve got a good family, six grandkids, six great grandkids and great friends." said Guthrie. More Fun Facts About Montie Lester Guthrie Jr. Most Memorable Historical Events - D Day, June 6, 1944 "how full the sky was of gliders and airplanes" and VE Day, May 8, 1945 "the night the lights first came back on in many years. People were celebrating and you couldn’t move down the street." We would like to Congratulate our Family on their job well done on a recent weight lifting competiton. This is how well they all did. We have certainly lost a couple of the cornerstones in our community the last few days. Lewis Miles Guthrie passed away last Friday and Lodema Jones on Monday. Both of these lifetime and longtime residents of Santa Anna will certainly be missed. Please remember their families in your prayers. August 20, 2009---- Orientation for 7th grade students and their Parents @ 6:00 p.m.
A very interesting program will be held at Heritage Hall on Thursday evening, August 6th. At 7:00PM. 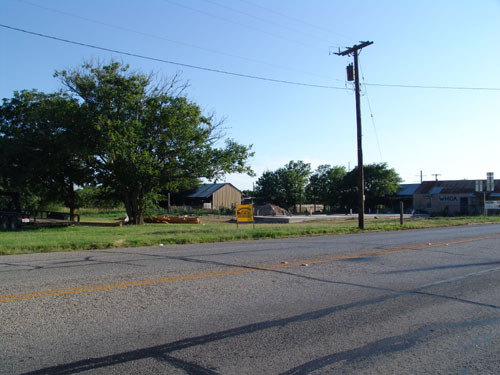 The Coleman County Historical Commission will present one of it’s programs on the old ranches in Coleman County. Jane Padgitt , of the Padgitt ranch, will present a program covering the better part of southwestern Coleman and it’s ranching history. All interested Colman County citizens are invited, all members are expected. I poured another half inch or so on Saturday the First of August and another inch and a half on the Sunday. Tex Wright reports, "I emptied another .30 on Saturday morning. Most of the rain fell Friday afternoon. Gives me 2.25 for the session." and "Here at the foot of the Santa Anna Mountains we received 1.20 on Saturday afternoon and evening"
A "Power Points of Prophecy Seminar" is being held at the Seventh Day Adventist Church in Santa Anna, Texas. The meetings are 7 PM to 8:30 PM, Thursday JULY 23 thru Saturday AUGUST 22, 2009, with no meetings on Sundays or Wednesdays. Lynnwood Spangler is the presenter for this Seminar. Lynnwood has shared this "Power Points of Prophecy Seminar" around the world: in Africa, Asia, South America, the Philippines and Europe, as well as throughout the USA. He presents this seminar as a thought-provoking study of the Bible prophecies affecting our world today. Lynnwood's dynamic illustrated presentations are easy to follow, helping thousands obtain a clearer understanding of world events from a Biblical perspective. Those attending will gain new insights to life's most pressing questions. The Bible alone will be the only textbook used. In fact all who attend will be offered a King James Version Bible to use during the Seminar, which will be a gift to them at the close of the meetings on August 22nd. There will be free study materials handed out to assist in more in-depth studies of each night's presentation. All are welcome to attend, none are excluded; we all need to be well informed and to prepare for the events that are overtaking our world today. Drawing for free gifts are held nightly. We encourage you to come early so you can participate in the free gifts that are given each evening. Please feel free to bring your children with you: Free Nursery care will be provided for children 0-3 years of age and a free "Kids' Time" program will be held for children 4-12 years of age, each night of the Seminar. Presenters for the "Kids' Time" programs will be Lyle & Carol Linscott from Cisco, Texas. Carol was the director of our recent "Crocodile Dock" Vacation Bible School, so you know it will be a great experience for your children! 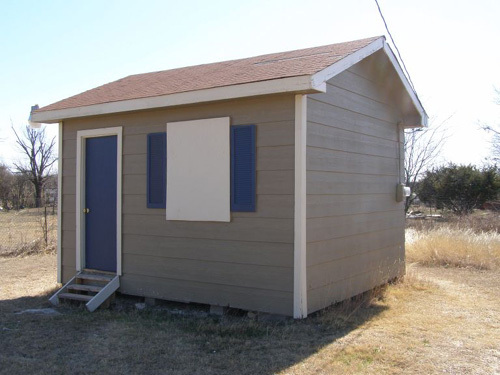 142 CR 106, Santa Anna, Texas 76878. Is it really time to go back to school? Maybe not! But it is time to start thinking about and get those Summer vacations in. Two a day work outs start August 3rd for football and volleyball. There are scrimmages on the 15th and 22nd and the first game is a JV game on the 27th and a Varsity game on the 28th. According to the school calendar the first day of school is August 24th. Texas shoppers get a break from state and local sales taxes on August 21, 22 and 23 - the state's annual tax holiday. 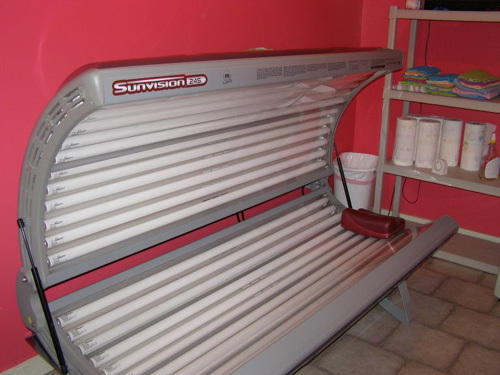 Lay-away plans can be used again this year to take advantage of the sales tax holiday. As in previous years, the law exempts most clothing and footwear priced under $100 from sales and use taxes, which could save shoppers about $8 on every $100 they spend. Backpacks under $100 and used by elementary and secondary students are also exempt. A backpack is a pack with straps one wears on the back. The exemption during the sales tax holiday includes backpacks with wheels, provided they can also be worn on the back like a traditional backpack, and messenger bags. The exemption does not include items that are reasonably defined as luggage, briefcases, athletic/duffle/gym bags, computer bags, purses or framed backpacks. Ten or fewer backpacks can be purchased tax-free at one time without providing an exemption certificate to the seller. School Supplies - New in 2009! The 81st Texas Legislature recently passed HB 1801 (2009) expanding the list of items qualifying for exemption from Texas state and local sales and use taxes during the annual sales tax holiday in August. Effective this year, in addition to clothes, footwear and some backpacks, Texas families also get a sales tax break on most school supplies priced at less than $100 purchased for use by a student in an elementary or secondary school. No exemption certificate is required - with one exception. If the purchaser is buying the supplies under a business account, the retailer must obtain an exemption certificate from the purchaser certifying that the items are purchased for use by an elementary or secondary school student. “Under a business account” means the purchaser is using a business credit card or business check rather than a personal credit card or personal check; being billed under a business account maintained at the retailer; or is using a business membership at a retailer that is membership based. A word of caution: If you sell items that do not qualify for the exemption, you may not advertise or promise that you will pay your customers' sales tax. Additionally, you are prohibited from advertising that you will not collect sales tax on items that do not qualify. You may advertise that tax is included in the sales price of the taxable items that you sell, however. For information on how to report tax on these sales, please visit Reporting Sales Tax on Tax-Free Items or call us toll free at (800) 252-5555. 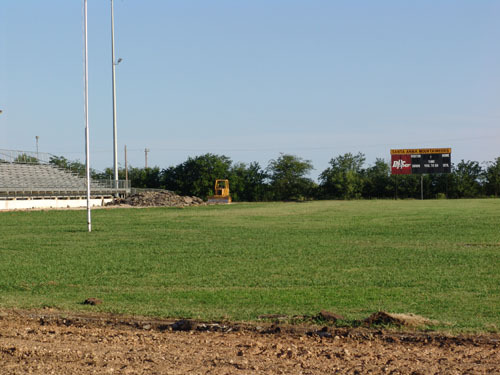 The date for the 2009 Homecoming will be October 9th for the Homecoming Parade and football game and Saturday the 10th for the Santa Anna Ex Student's Association Annual Meeting. It will be here before we know it so be sure and get all those class reunion plans started right now! Send an e-mail to news@santaannanews.com and I will put you in touch with Connie. Any others having reunions are welcome to get them started right here too!